According to Native North American legend, the caterpillar transforms into the butterfly to teach us that all life is transitory. The Butterflies are ancestor spirits. Before they leave this Earth, they are permitted one last time, to return to the places of ceremony and celebration, the sacred places where as humans they experienced great joy. 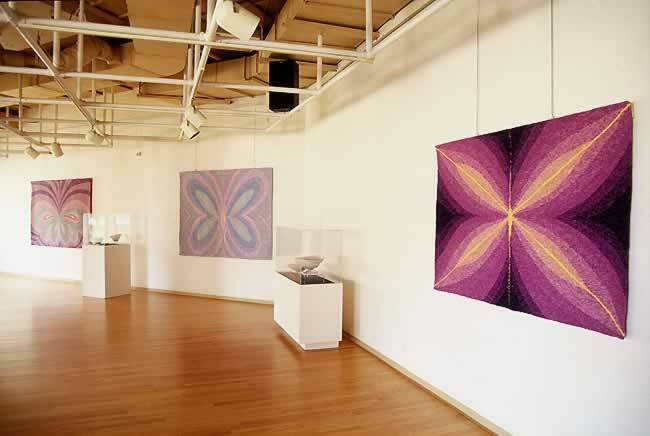 Butterfly Blanket 1 was exhibited in Lodz, Poland in 1998 as part of the International Fiber Arts Symposium. Papillon 4 was purchased by the Ministere de la Culture et des Communications, through the programme, Integration des Arts a l’Architecture, for the Bibliotheque de Masson-Angers, Ville de Gatineau, Quebec.